Old style great look very durable. Add a touch of the vintage to your dining area with this set of twovintage metal dining chairs. The scratch- and mar-resistant powdercoat finish prevents scratches and signs of wear and makes clean-upa snap. 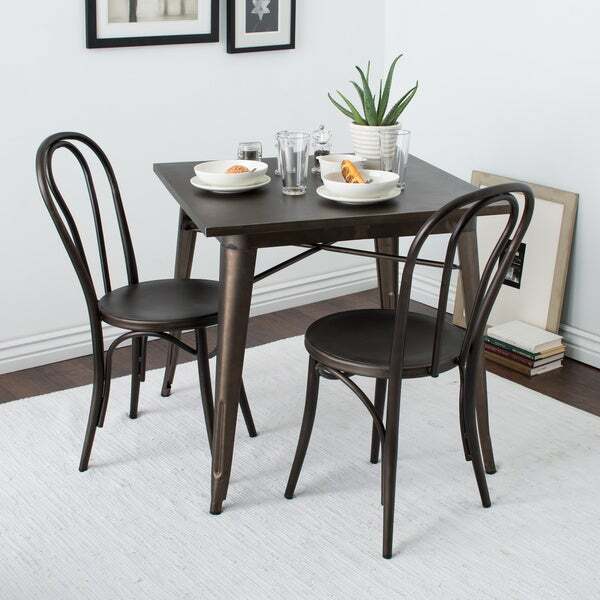 The foot glides of these metal dining chairs are speciallydesigned not to mar hardwood floors and these chairs arrive fullyassembled for your convenience. I got 4 of these chairs to use with a 36" wrought iron table with a mosaic top. They arrived in pristine condition, with the most thorough packaging I've ever seen! Their simple style goes perfectly with my table. All 4 chairs can fit easily around the table without it feeling too crowded. They are sturdy, and quite comfortable to sit on. The chairs are of tubular metal construction (not solid iron), so they do sound loudly metallic & hollow when you move them around. The "dark vintage" color is best described as graphite: a dark metallic grey with a slight sheen to it. No mention was made in the description about whether these chairs can be used out-of-doors, so I will be painting them with rust-retarding enamel paint before I take them outside. Over all, I feel that this was a good purchase. Very pretty chairs. I purchased the *** dining table and they pair together very nicely. They are a brown/grey color, but they reflect the color of the walls. In my grey dining room they look grey/black. In my beige kitchen, they look more brown. Keep that in mind. Some areas look dented, melted, or like the paint job isn't quite right, but it is not overly noticeable. Overall, they are very nice. These chairs are very sturdy and work perfectly in my dining room. Super great price for the pair. Perfect for extra seating during holiday or family get togethers. All metal and pretty sturdy. Would definitely recommend for the money. Prob one of the best purchases I’ve made on here. They’re quite elegant, easy to care for, and go well with our rustic/industrial decor. These chairs have the vintage look with modern finish/materials. Best of both worlds. I purchased these two chairs this past Spring, and I couldn't be more pleased with them. They were exactly what I was looking for. Color, size, and a match for the table I bought separately somewhere else. I highly recommend them, The other thing that was great about them was there no assembly required!!! That's just what I needed. I thought I might need to buy chairs pads or cushions, but you really don't need to. Thanks again, Overstock! Great quality and comfortable chairs. Well packaged upon arrival. Great for our breakfast nook. We purchased these chairs for our breakfast nook. We were looking for a cafe style to go with a round table and these are perfect. They are nicely heavy and look great in our space. Color is great and very sturdy. Big bonus that they come fully assembled unlike most chairs. Product was tracked and received in a very timely manner. 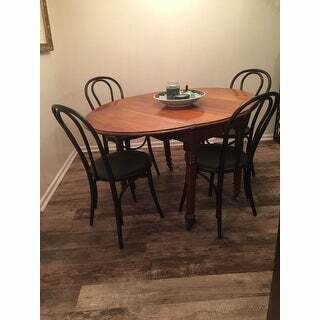 I am pleased with the quality and it goes well with a table I had purchased. The chairs are heavy enough to be stable. love these chairs! was concerned that they wouldn't be as nice as they looked in the picture, but they were even better. started out with one pair and ordered another. Came quick and look great. Husbands bigger but holds him perfectly!! I have a small antique table and needed some sturdy chairs for it. One of the requirements was they had to be small enough to fit between the narrow legs and these worked perfect. They are small but sturdy. Shipping was fast and the chairs were packed well. These chairs are exactly what I wanted to go with my glass table that I also ordered from Overstock. I have six and they come completely put together. They are strong and sturdy, yet lightweight enough to move around easily. And actually very comfortable. My husband really likes them too! super fast shipping-chairs are perfect and look great with my others. These chairs will go with everything. They are simple and nice looking. They meet my needs just fine. Hoping they last long term. "Does the seat have some form of cushion or is it metal too?" "Has anyone tried to paint/spray paint these?" Use a professional brand for metal. "Are these chairs commercially rated?" "Can you just buy one of these?" Hello HTGINDY, unfortunately, these chairs currently only come in a set of one. Sorry for the inconvenience. Thank you for shopping with us! "Can these be used outside?" Hello zoebalbion, yes, the Cafe Dark Vintage Metal Side Chairs (Set of 2) can be used outside, in our opinion. Have a great day. color I have been looking for in this style. The fact that fully assemble. The price. "is there an armchair version of these? i see a bench but I'd also like an armchair." Hello dorot, we offer the matching bench under item number 15812129. Unfortunately, we do not offer the version of this chair with arms. Sorry for the inconvenience. Thank you for shopping with us! Thank you for your question, dorot. Unfortunately, we could not find an arm chair version of the Cafe Dark Vintage Metal Side Chairs (Set of 2). We are sorry. Have a great day.